For an instant, Le Thrang paused. He leaned back against the post that supported one side of the porch roof and hugged himself. But another piercing cry came from within the house, and he simply had to move. Three fitful strides carried him a bit farther from his wife’s pain … pain that he, in his foolish need, had brought upon her. Le Thrang halted, squinting at the horizon. A new cry made him shudder, cast guilty eyes backward. The screams were coming much quicker now. Was this a good sign or a bad one? He did not dare ask directly. “But in your experience?” the young carpenter persisted. “Nine hours …” Le Thrang eyed the lowering sun. “Just be glad the Chinese are still occupied with those northern savages,” Phan Dong suggested. Another cry cut him short. “But tonight …?” the goldsmith asked. Both men started, jumped at the worst-sounding scream so far. Le Thrang took a blind, mindless step toward his home. And now, abruptly, there was silence from within. Where were the terrible but now-familiar cries of pain and struggle? Speechless, Le Thrang watched his friend’s wife appear in the doorway and smile. Le Thrang sighed. Then he hurried past her, his heart pounding to a strange new rhythm. Inside, he went straight to Vho. The stoop-shouldered midwife gave him a moist cloth and he wiped sweat from his weak, smiling wife’s brow. Then he looked down at the tiny bundle by her side, the little face wrinkled and reddish. “It must be a very old house,” Le Thrang said dryly. Le Thrang stood there gaping, unable to respond. The old midwife made her bustling exit and he turned to his wife, gesturing. Vho laughed. “Yes, isn’t she extraordinary? But we must prepare …” She held her complaining infant to her side with one hand and peeled back the covers with the other. But when she tried to sit upright, Vho winced. Vho’s smile was grateful, and he felt the need to kiss her lightly. Then Le Thrang thought to do the same with his newborn child. Iron Dragon cried out when his large form bent over her and blotted out the red sunset. Perhaps she mistook her father for a demon? Le Thrang kissed her small, red forehead anyway. Then he went into the other room and began the unfamiliar task of housecleaning. He swept and folded and rearranged. He put out candles and incense sticks. Trays of smoked fish and sweetmeats followed. And as the night deepened, he made sure that each door and window in his small but comfortable home was opened wide. That done, he took a tray of light food to his wife. She ate a rice cake even as their daughter suckled. Le Thrang could not resist a proud smile. Now, if only he could somehow earn his stern, long-dead father’s approval! He went into the corner where he kept the family’s Sacred Relics. Slowly, reverently, he brought forth a fine linen handkerchief. It was folded with artful precision. “Your father’s?” his wife asked, though she knew the answer well. Le Thrang blinked, smiled at her. Later they sat together with Iron Dragon nearby in a cradle her father had personally fashioned from prized Cham eaglewood. The adults faced the main door, knowing most of their ancestors would choose it as their place of entrance. “That is the way of ghosts,” Vho responded. The baby chose that instant to begin her first loud, truly sustained crying fit. Ten minutes later, after both parents had tried and failed to calm the infant, they settled once more. “You still feel fortunate?” Vho said wryly. Le Thrang sighed. His father liked order in his home and quiet. He would not appreciate a squalling newborn on the one night of the year in which he and the other spirits came to visit! But then, what did it matter? None of what Le Thrang had done before had ever been good enough. Why should this time, this year be any different? Vho saw her husband’s shoulder sink and decided Iron Dragon could wait. Le Thrang stared at her open-mouthed. He’d never heard such defiant, outlandish talk from her. Pride surged over the humble young carpenter. He looked from his wife to his crying baby’s cradle and back again. "Let him come, then.” He took Vho’s hand and held it, facing the door with a smile. But then, as out of nowhere, a strange wind arrived. It was unnatural, that wind. They both sensed this, even before it lifted the handkerchief from Le Thrang’s breast and tossed it, twisting in its weird currents, beyond his lunging grasp. That wind moved only the Sacred Relic, affecting nothing else. The two could not even feel the breeze’s touch upon their skin, nor see the slightest movement in the loose strands of their hair. His new daughter was still yelling at the top of her tiny lungs, and Le Thrang knew it was a sign. In horror and fear, he saw the bit of folded linen pause directly above the cradle. Then, at once, the weird breeze quit and the handkerchief tumbled, drifting and unfolding as it went down into Iron Dragon’s open-topped resting place. His wife stroked his wrist, brought her face to his knuckles and kissed them. Then, exchanging wide-eyed stares, they realized the sudden silence…followed by a soft gurgle of…contentment? Le Thrang helped his wife to her feet and together, hearts pounding, they peered into the cradle. Iron Dragon sat upright, though she was far too young to do so … not on her own, at the very least. She was also too young to truly smile, or to recognize them on sight alone, or to grip anything in her unsteady, newborn hands. Yet the infant had a bright loving grin and she aimed it up at them in apparent purpose. And in two pudgy little hands, their daughter held two corners of a rumpled linen handkerchief. When Le Thrang and Vho turned to each other and embraced, no words were possible … or necessary. Rising the next morning, they discovered many of the treats Le Thrang had put out were gone. Others had been nibbled, leaving odd-shaped, delicate, almost spectral tooth marks behind. Seeing these, the young couple laughed. They continued laughing as they closed and locked each door and window at first light. And in her cradle, their first child also laughed. For the first hours of her life, Iron Dragon had seemed a somewhat cranky child, but no more. For as it is often said, a father’s blessing can mean so very much! Previously published in PANDORA, issue #29, 1993. 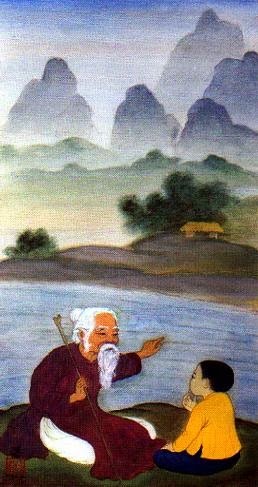 Image: Old man and a child by Mai Trung Thu (1906-1980). Source. Jim Lee is a lifelong resident of a small Pennsylvania town better know for producing a Olympic swim champ/early movie Tarzan (Johnny Weismuller); the DJ who popularized the term Rock 'n' Roll (Alan "Moondoggie" Freed); and millions of tons of coal dust. Jim has been publishing his short stories, poems and nonfiction since 1982. In late 2012 he co-founded a local nonprofit, The Sanctuary of Steele, Inc., which assists creative people through various bad times. Jim was recently interviewed for the internet radio show "Pandorah's Crypt" and appears in Blair Murphy's low-budget film ZOMBIE DREAM (scheduled for release in April 2014). More of Jim's fiction can be found at his Amazon Author Page. What advice do you have for other fantasy writers? Write from the heart, what moves and interests you--not what you think is the 'hot' topic or theme of the moment.